On Saturday 6th December at around 10pm two Greek policemen were on patrol in central Athens. They had an argument with some young people & during the argument one of the policemen pulled his gun & murdered 16 year-old Alexandros Grigoropoulos. The murder sparked angry riots throughout Greece. Hundreds of schools & universities are under occupation. TV & radio stations have been occupied. Banks & shopping malls, symbols of greed & corruption, have been attacked. & the Greek police are running out of tear gas while politicians bleat. The demonstrations are clearly about something more than the murder of an innocent young man. The protesters are not the ‘mindless thugs’ the media would have us believe, but are organised. They have a large support base & are acting in rage against a repressive, destructive system called capitalism. People everywhere are waking up to the fact that governments do not care about them, but are more than willing to spend billions of pounds to prop up the very financial institutions which have wrought havoc with our lives. Solidarity with Greek protesters is spreading like wildfire across the world. Demonstrations have taken place in Paris, Berlin, Melbourne, New York, St Petersburg, Madrid & London. Greek embassies have been occupied and, in Cardiff, slogans were daubed on the walls of Canton police station and two police vans covered in paint stripper. 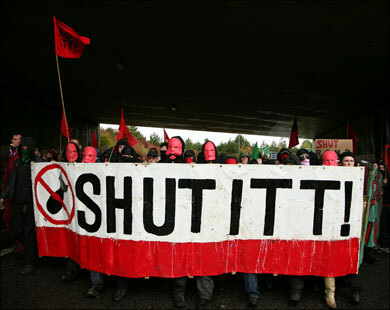 Follow events via Occupied London, Indymedia Global, and the Centre for Strategic Anarchy. In response to the international call out for a day of action in solidarity, South Wales Anarchists will be meeting on Saturday 20th December, 12 noon at Nye Bevan statue, Queen Street, Cardiff to demonstrate solidarity with those resisting state repression on the streets of Greece and in memory of Alexis Grigoropoulos. We will be distributing a new edition of Gagged! and information about the uprising. Cardiff Anarchist Black Cross recently received a letter from Political Prisoner Sean Kirtly, where he tells the story of how he ended up incarcerated, you can read it here. Cardiff Anarchist Black Cross is part of an international movement supporting the struggles of prisoners, and of anarchist and class struggle prisoners in particular. With houses already unaffordable for working class people plus growing numbers of evictions and home repossessions, what options are left to us as recession bites? Some people are starting to advocate squatting as the only viable solution. The squat at 87 Ashley Road, Bristol, is owned by Places for People (P4P), the UK’s biggest housing association. Incidentally it also boasts the highest paid chief executive in the housing sector. P4P’s director trousered £258,000 in 2007. Housing associations were set up to fill the gap left by Thatcher’s destruction of social housing provision. Legally, they cannot make profits, so they make up by handing out big fat cheques to fat cat bosses. And let’s not forget that it’s our money which is going to fund these extravagant payouts. 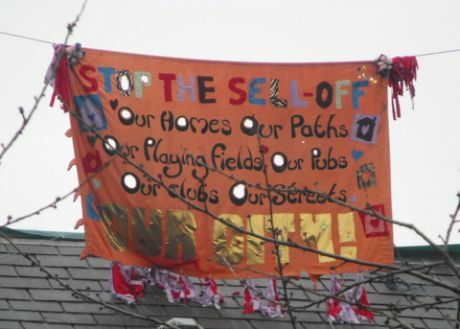 At 10am on the 12th November police and bailiffs attempted to evict the squatters. Residents awoke that morning to find the street shut off and around a dozen riot vans parked outside. The front garden was a sea of police in riot gear with angle grinders and battering rams. Residents then agreed that the best way to resist this eviction was by occupying the roof. Unable to remove the squatters, police and bailiffs set about smashing up the property to make it uninhabitable. Those on the roof remained in good spirits and plenty of people were giving them support on the ground until a temporary halt to the action came on 27 November when a public meeting was called to discuss the matter. Unsurprisingly P4P failed to turn up. In the meantime P4P continues to do its bit to solve the housing crisis by flogging off one-bedroomed flats for £140,000 and making the area even less affordable to ordinary people! Despite all this the residents of 87 Ashley Road are determined to stay. South Wales activists travelled to Brighton to take part in the ‘Shut ITT’ demonstration on 15th October 2008, which aimed to shut down the EDO MBM arms factory there. They joined 400 activists from around the country in this mass anti-militarist action. EDO MBM Technology Ltd is owned by ITT, a US-based multinational arms dealer. They have contracts with the UK Ministry of ‘Defence’ and US arms giant Raytheon (see the article on St Athan) to supply the release mechanisms for the Paveway III guided bomb system. The Paveway bomb was the most commonly used munition in the 2003 ‘shock and awe’ destruction of Baghdad and murder of thousands of innocent Iraqis. After four years of setbacks, Paveway IV is now in full production in the UK. EDO also makes components for tanks, helicopters and unmanned combat air vehicles. Research into the company has revealed direct links between its supply of Israeli F16 bomb release units, and war crimes committed by the Israeli military in the Occupied Territories. Before the march moved off, police read out a ‘Section 60’ notice, used to enforce the removal of face coverings. A number of arrests were made at this early stage for failing to comply with the instruction and for obstructing police in their ‘duty’. The 400-strong march then started on its way, with the aim of reaching the factory to protest. However, as the group approached the EDO factory, its progress was blocked by a large number of police. Attempts were made to break through police lines, only to be met with batons, pepper spray used at short range and cops in full riot gear. Half the protestors then took to an elevated wooded area, giving access to the rear of the factory. Along the way there were further skirmishes with cops and their dogs. Some of the police officers present, batons drawn, appeared to be provoking protestors. In spite of this repression, the back of the factory still got covered in red paint. The protesters eventually managed to evade all police cordons and marched into the centre of Brighton. A substantial number of activists made a break into a park, the cops having lost control. A party on the beach followed after six hours of protest. There were ten arrests, four houses searched and up to twenty protesters injured by police. For more information on this ongoing campaign, see www.smashedo.org.uk. Plaid AM Bethan Jenkins has uncovered that 64,000 Welsh young people are now on the national DNA database – that’s more than 1 in 5 people between the ages of 10 and 17! Are 1 in 5 of our kids criminals? Of course not. But Welsh cops have been on a DNA thieving-spree for the last 10 years, and have already doubled the number of people whose “genetic fingerprint” is being kept on record, irrespective of whether they’ve committed a crime. Spurred on by a right-wing media which demonises young people as criminal hoodies, and aided by more than a decade of Blairite policies which have given the police unprecedented powers, the cops are now completely out of control. Those who agree with this biological identity theft say that it helps catch murderers and solve ‘cold cases’ – this just doesn’t wash as an excuse to catalogue the DNA of children. The only possible reason for storing the DNA of so many innocent young people could be the extension of our surveillance society, and normalising and extending state control over the lives of coming generations of adults. Last year there were more than 264,420 on the database overall; many are innocent and have never been charged with anything, but their sample will be kept for life. The annual number of samples taken by Welsh police forces was twice as high as in 2006-7 as it was a decade ago. 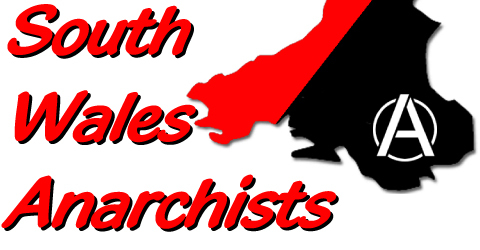 If you are interested in fighting back against Big Brother and the growing power of the police state come along to a meeting of the South Wales Anarchists, and we’ll fight back together.